Here, chef Jimmy Bannos Jr. shares the secret to the most incredible deviled egg ever. "We blend the yolk to a really smooth texture and add béchamel, Parmigiano, Pecorino Noce, nutmeg and black pepper. We pipe this from a pastry bag into the middle of the egg (it's important to keep the original halves together so they fit correctly), overflowing a little so it acts like glue and keeps the egg halves together. 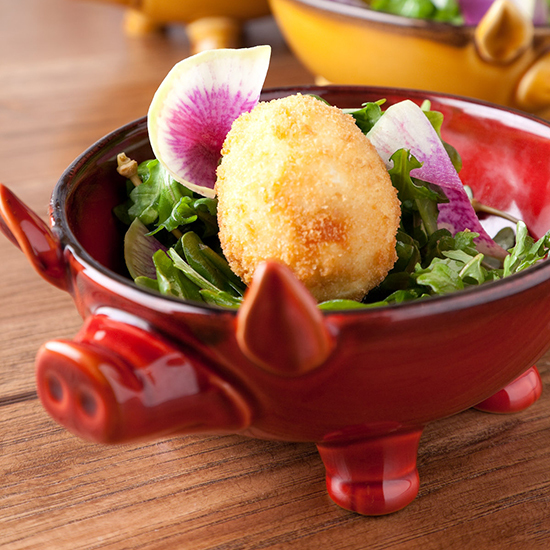 We dip the egg in a mix of Wondra flour and water, then breadcrumbs, fry it up and serve with mixed greens and capers."